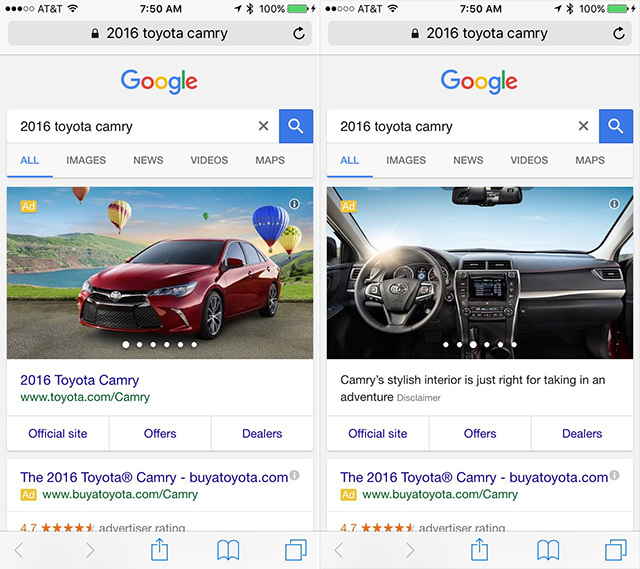 Google announced a new search ads, AdWords, format for automative ads for OEMs such as Toyota, Honda, etc. Now, if the OEM is buying ads, they have the option to have a richer experience with their ads. The ads come up for searches around their brand name, models, dealers, etc. And they contain quality images in an image carousel, a link to the official site, current offers on the model and a link to local dealers on Google Maps. This is available only in the US. Dealer Automotive ads are available to franchise and authorized dealerships in the US. You can learn more about Model Automotive ads or Dealer Automotive ads by reaching out to your AdWords account team.